For a groom who’s a Dr. Who fan, make a TARDIS cake! Part 1 we’ll talk about the Dark Chocolate Buttercream Frosting that went into the layers. 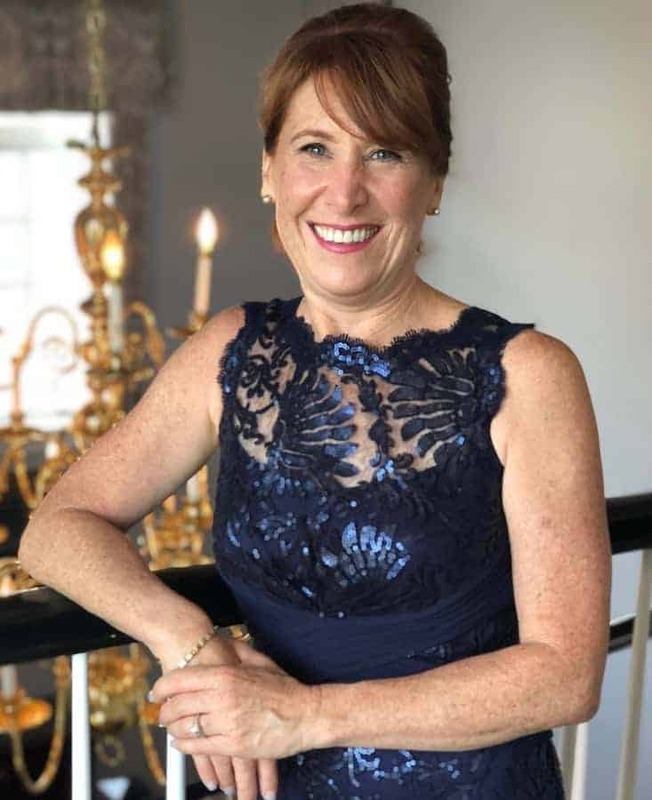 In my last baking post (two weeks ago…my how time flies! 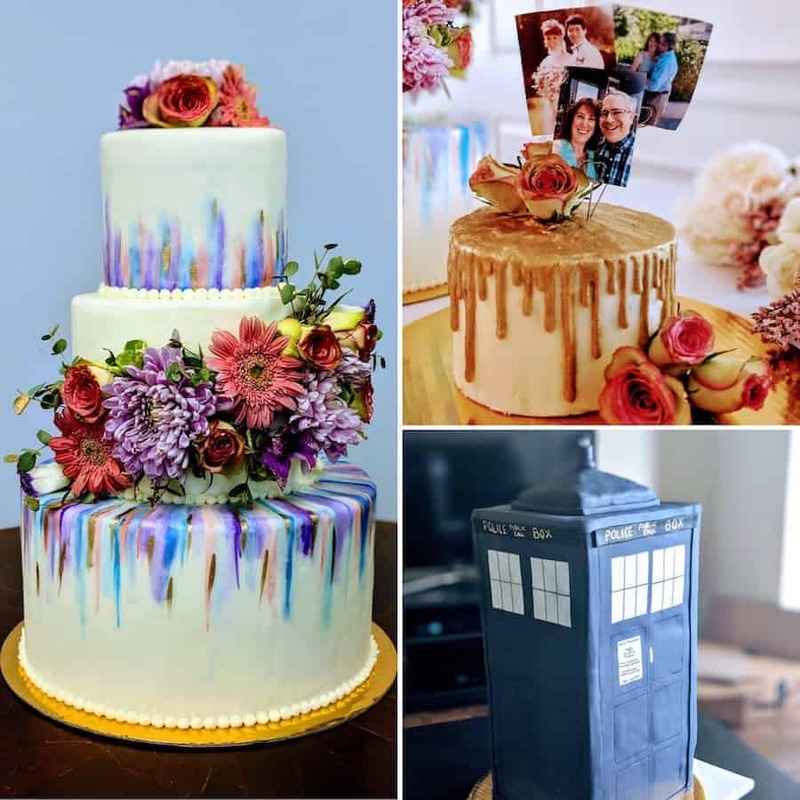 ), I talked about the DIY Wedding Cake my younger daughter and I made for my older daughter’s wedding, and I mentioned the TARDIS cake we made for the groom. We all wanted to surprise him (both daughters and I), and boy did it work! He was delighted (and touched, I think) that his new family wanted to do something special just for him. My son-in-law (aka S-I-L) is a huge Dr. Who fan. He collects figures of the various doctors and TARDIS’s and displays them in their den. I’m too wrapped up in my own Outlander fandom, (** ahem…figures of my own **) so I’m not going to judge. I know nothing about Dr. Who, just that the TARDIS is a iconic part of the show (I plan to start watching it with him when the new season starts in October…at least he’ll be able to explain things that I’ve missed over the last, oh, 50 years or so!). My S-I-L gets these figures from TITAN merchandise, a company that makes figures for many different shows and fandoms…he even runs The Unofficial TITAN Merchandise Society on Facebook and has a YouTube channel dedicated to unboxing videos of said figures. (Shameless plug, I know, but he’s family!). Getting back to the TARDIS cake (finally! )…a lot of work went into making it. 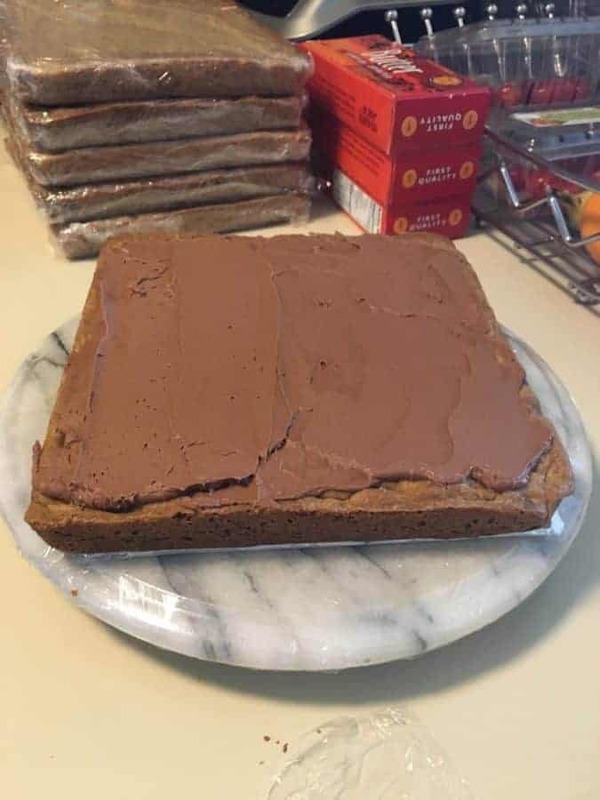 It stood 18-inches high and was made in a 9-inch square baking pan. 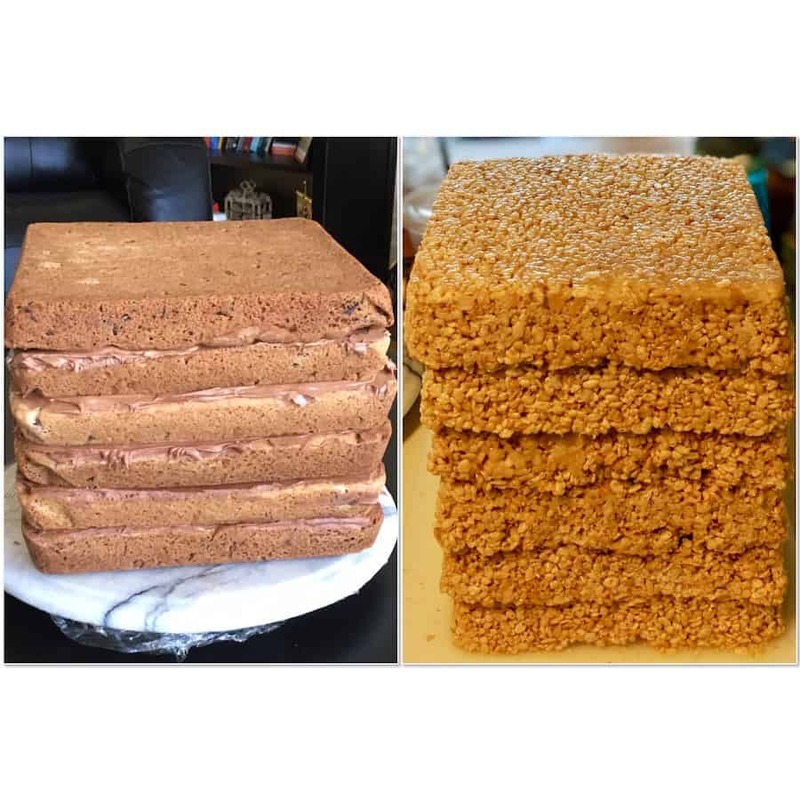 The lower two-thirds of the cake were made of 6 layers of 2-inch high Crisped Rice Cereal Treats, the upper one-third was 6 layers of 1-inch high Chocolate Chip Cookie Cake, and in between all those layers was Dark Chocolate Buttercream Frosting. It was huge, heavy, and delicious! Because there were so many recipes that went into making this TARDIS cake, I’m going to break it up into 3 parts over the next few weeks (I haven’t had a series since Tea Time and Finger Food…after all, who doesn’t love a good series?). 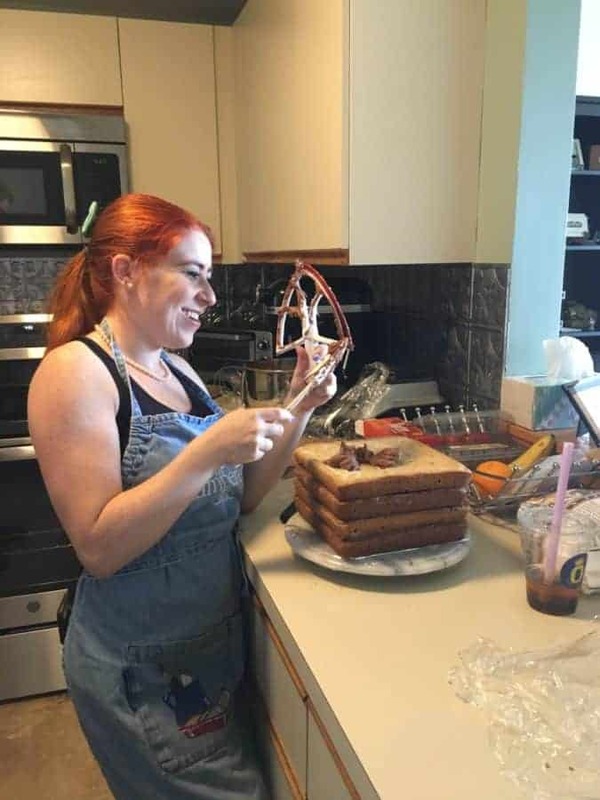 Part I is the Dark Chocolate Buttercream Frosting we used for the layers, and for that write-up I have my first ever guest contributor, my lovely and talented younger daughter! So without further ado (yes, we need much less ado around here! ), here she is! I’ll preface this by saying that I haven’t used a recipe to make buttercream frosting in years as I find that ingredient amounts vary and can depend a lot on what I’m using the frosting for. That being said, here’s my approximate recipe for my favorite Dark Chocolate Buttercream Frosting. The consistency (and therefore the recipe) that you want your frosting to be depends largely on what it will be used for. As filling, a thicker frosting adds structure and height to cakes, but that thick frosting is hard to spread evenly and will tear at cakes. For your crumb coat and frosting layer, you want a thinner, more easily spreadable consistency. Luckily, the recipe can easily be made into any consistency and can even switch between consistencies with simple additions. Other uses for this recipe include truffle filling (see Step 7 below) or a snack on its own, which is my favorite way to enjoy it…all you need is a spoon and no shame. Place your softened butter in a stand mixer and beat about 30 seconds until smooth (longer for colder butter, shorter for softer. If your butter is very soft, you can just put the whole stick in without bothering to cut it first). Slowly begin adding powdered sugar, mixing on low speed to maintain some appearance of cleanliness in your kitchen, in stages. Once the first addition is well combined, add the next. Remember to scrape down the sides of your bowl to keep everything mixed in evenly. The mixture will become lighter in colour (more white, less yellow) and thicker as you add powdered sugar. For thicker frostings, you will want a higher ratio of sugar to butter, for thinner, keep them more even. You can now add some liquid (a little goes a long way!) to adjust the consistency to suit your purposes. If you add too much liquid, you can always add in more powdered sugar to stiffen it back up. This holds true at any time as well. If you’re frosting your cake and decide it’s too thin, mix in some more powdered sugar. If it’s too thick, add some more liquid. While this is mixing, melt your dark chocolate however you prefer, I use the microwave in 45 second increments. Mix the chocolate until smooth, set aside. When all your powdered sugar has been added, beat the frosting on a higher speed to make it more fluffy, usually about 1-2 minutes. Once it is at the consistency you want, pour in the melted chocolate and mix on medium speed until combined. Once fully combined, go back to high speed for another 30 seconds or so for some extra aeration. You have frosting! Fill, crumb coat, and frost away! Or, keep the frosting very thick, scoop and roll into small balls, and freeze for 15 minutes then dip in tempered chocolate, to make some dangerous Dark Chocolate Truffles. Or be like me and take this opportunity to lick the bowl and beaters as a reward for your hard work! Softened butter works best. You can use colder butter, but it will take much longer to get the nice smooth consistency you want and you may end up with flecks of unmixed butter in your frosting. For the dark chocolate, chips, bars, or anything else works since you’re going to melt it. Also, the darker the better! Even for those who don’t like super dark chocolate, I’d still use dark chocolate if you have it because there is so much sugar in the frosting itself, it will still be very sweet and the darker chocolate has a richer flavor. Now normally I put vanilla in everything and usually about 3 or 4 times the recommended amount because I love vanilla extract. However, lately I haven’t been using vanilla in my buttercream and I’m finding it comes out just as good if not better, so the choice is yours. Store your frosting in an airtight container in the fridge. If you’re planning to use it again, let it soften on the counter for several hours before using (you can stick it in the microwave for 10-15 seconds to help soften it if you’re short on time). It’s even better if you can whip it on high speed in your mixer for 30 seconds for a better consistency before you use it (this of course assumes that you have any left over and didn’t eat it all before needing to use it before, which is something I wouldn’t understand). This recipe should be enough to frost and fill a 3-4 layer 6” round cake or any standard 8-9” round cake. I tend to use thick coats of frosting so I usually use more than expected. Remember, this is a basic outline and you can experiment as you see fit to make more or less frosting or to change the flavor or consistency to your taste. The amounts I gave are loose averages for what I generally end up using. Nutritional Information: You don’t want to know. 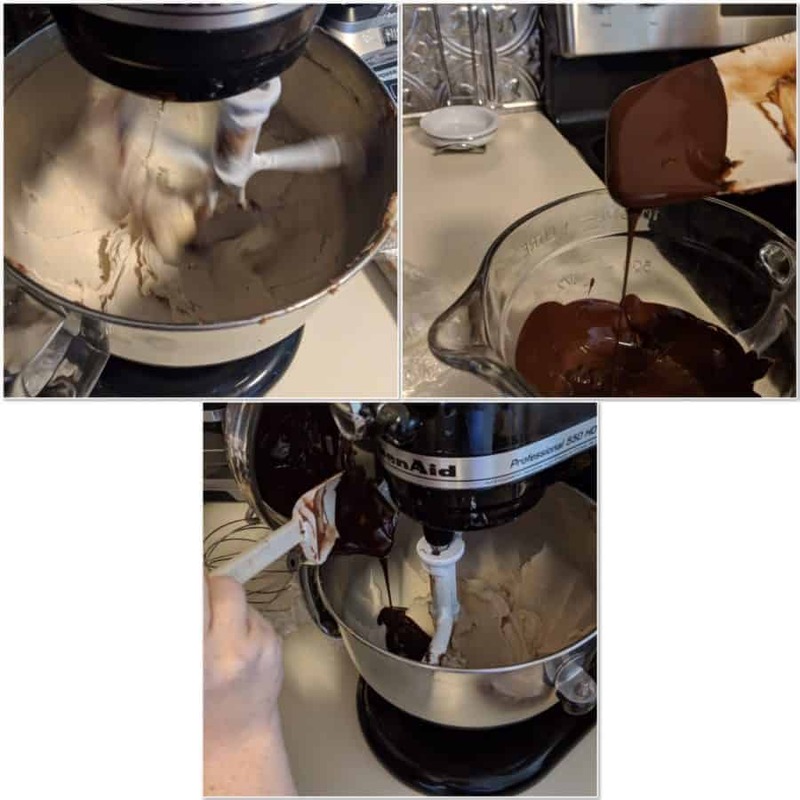 The steps to making Chocolate Buttercream Frosting…stir, melt, pour, stir again! Isn’t she wonderful?! (from my unbiased Mama perspective, of course). I really don’t know how many batches of frosting she had to make, but suffice it to say that we went through about 4 lbs of powdered sugar! Next time we have a baking post we’ll talk about the Chocolate Chip Cookie Cake that went into the TARDIS, so keep your eyes (and blog-readers) peeled for that. This is a process, folks! BTW I totally love following your blog! !